Lisa Gustinelli may seem like an ordinary Floridian. She is a mother; she teaches middle school; she goes to church with her family. 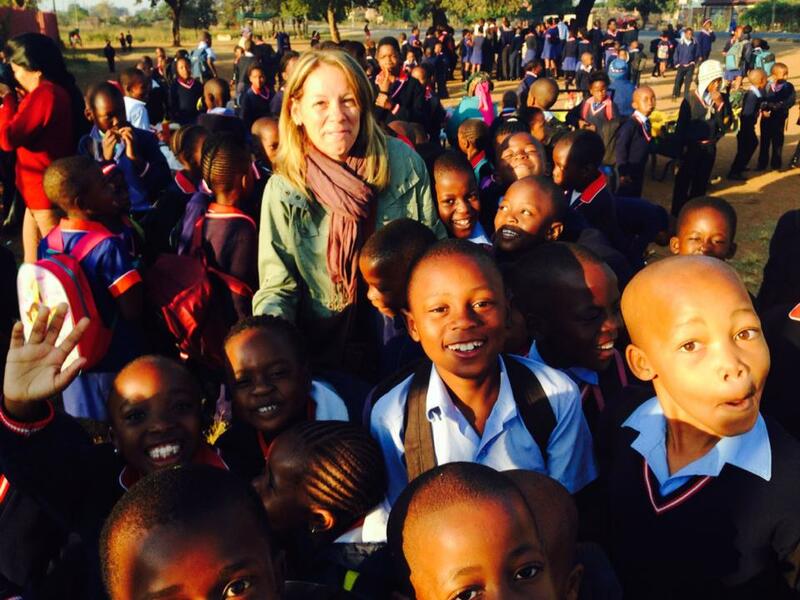 But recently, Lisa returned from a life changing trip to South Africa. 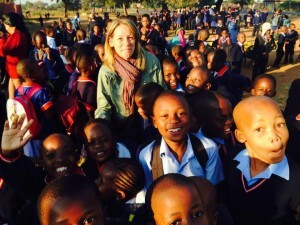 Life changing for her, and also for the students of St. Camillus School in Mandela Village. Here at Building Faith, we know that mission always involves formation. We caught up with Lisa to ask about her work and her faith. Why and how did were you called to go to South Africa? It actually started in Madagascar. In 2011, I went to Madagascar with a mission team from the Chapel of Saint Andrew’s in Boca Raton, FL. While there, the little children from the slum kept looking in the small window of the room where we set up five computers with Rosetta Stone. They were fascinated by the computers. I came back to Boca and literally could not sleep at night thinking about those children. I wrote to Todd and Patsy McGregor (our permanent missionaries in Madagascar) and asked if I could return and create a computer camp for the children living in abject poverty. “Madagascar in My Heart” was born, and I have returned every year since then. I was asked to help with a project for the Round Square conference in South Africa, and I suggested I bring my program to the children of Mandela Village. 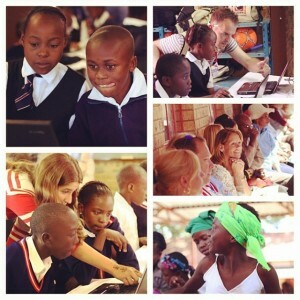 The Catholic Diocese of Pretoria helped connect with St. Camillus School, where a computer lab could be installed. The children who attend the school are completely supported by the order of St. Camillus. To make a long story short: we did it! You can see pictures of the opening here. Did you feel equipped, from your teaching background? Did your teaching skills help you on this trip? Of course my teaching skills and specifically my technology skills (I am obtaining a second Master’s in Educational Technology) have helped me, but honestly I simply bring computers equipped with basic educational software and mouse and keyboarding programs. For this last initiative, I had about 20 volunteer teachers from schools all over the world. They didn’t need computer skills but simply a love for working with children. How did Jesus surprise you? I can’t explain it. Jesus has not stopped surprising me. I started this mission and ever since I have been showered with love and support! So many people have come to me with offers of time, talent and treasure. I pray about everything in my mission to empower children through education, and Jesus has been there to open doors and to support me the entire time. The request to establish this lab in South Africa was a huge surprise. I take things day by day and have turned the entire project over to God as my leader. I am simply following his plan as I move forward as I know he is guiding me. I do have to tell you that every time I get ready to start another trip (I’ve done this program five times in different locations now), Satan manages to put many obstacles in my way. It’s gotten to the point where I just accept it, and this past time I actually giggled about it because he is no match for the love of God. Every time he tries to stand in my way God is right there supporting me. How were the children in South Africa similar or different from your students in Florida? The children come from abject poverty, yet they are super smart! They learn the computer skills as quickly and easily as any students I teach here. The big difference is that they are extremely appreciative of everything they are able to try. In Madagascar I teach children from ages 5-21. Sometimes a 16 year old boy is sharing a computer with a 10 year old girl, but he doesn’t care because he’s just so happy to learn. That might never happen here in the States. People always tell me what a good thing I am doing for the children, but honestly, I am the one who is blessed by their love and appreciation. Working with them fills my heart, it is simply what I have been called to do by Jesus. Being able to work with the children is being able to share God’s love. What would you tell someone who has an interest in doing something similar – going on a mission trip? I truly believe that God identifies out talents and calls us to use our gifts. I went on two mission trips to Honduras before the first life changing trip to Madagascar. I would tell people that doing the work of our Lord is extremely fulfilling. I would tell them to go on the trip with a servant’s heart in order for Jesus to reveal his grace. I have found that God is using me not only to help children in need, but to enrich the lives of the adults who help me. While I was in South Africa, I had many teachers helping me with the project. They thanked me for giving them the opportunity to work with the children. As I was taking pictures of the children in the lab, I couldn’t help but start snapping pictures of the adults who were helping me work with the children. The look on their faces as they taught the children was as priceless as the look on the children’s faces. Being able to do good for others is a gift from God. These adults were able to share in God’s grace and love as they cared for the least fortunate. They’ll see…. God is using us every day in everything we do. The opportunity to go on a mission trip is an opportunity to be a servant of God. You can hear Lisa in her own words in this video describing the initial motivations for her mission.